Here I am trying out our new Barclay cast iron pedestal bathtub. There is a very long story to this bathtub, but I will save it for another day. 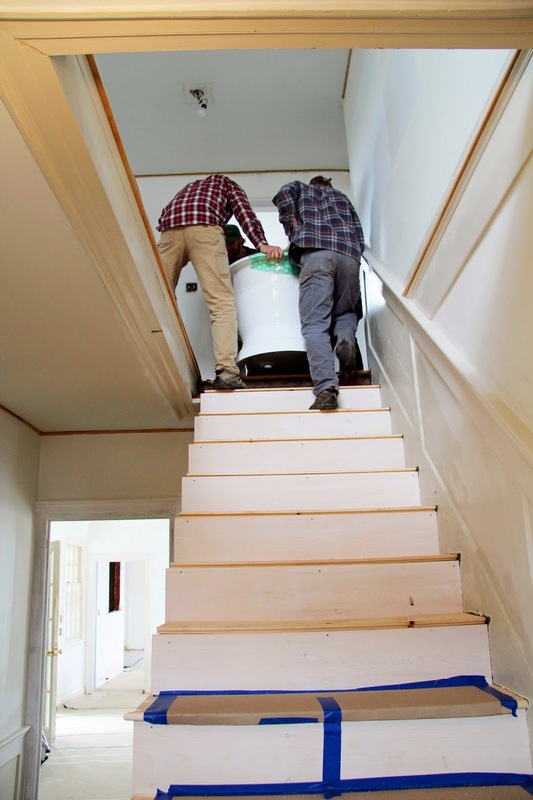 The short story is that this tub needed to be moved from the downstairs east parlor, to the upstairs master bedroom (for the master bathroom) before the stair railing was installed this week. 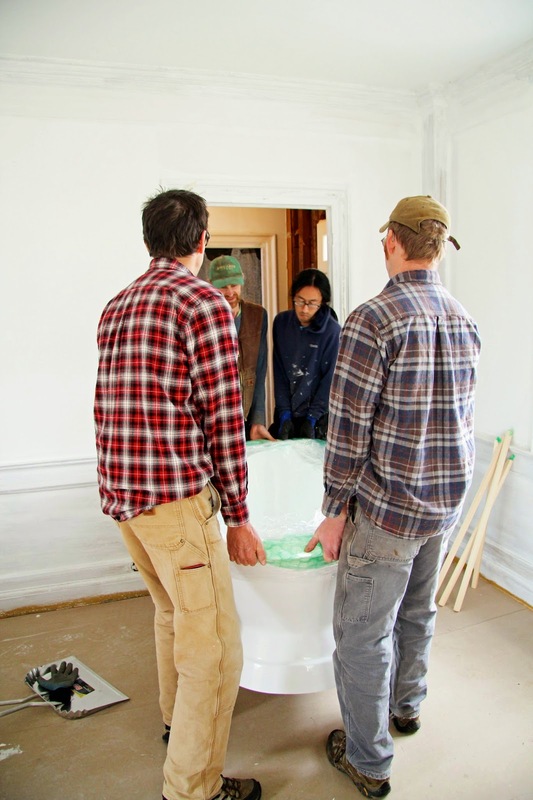 To move this very heavy bathtub, we needed FOUR MEN. Those four men included three very talented craftsman and one handy husband. All very STRONG, patient and of course, very handsome. I stood by offering little help as is usually the case when it comes to these things. 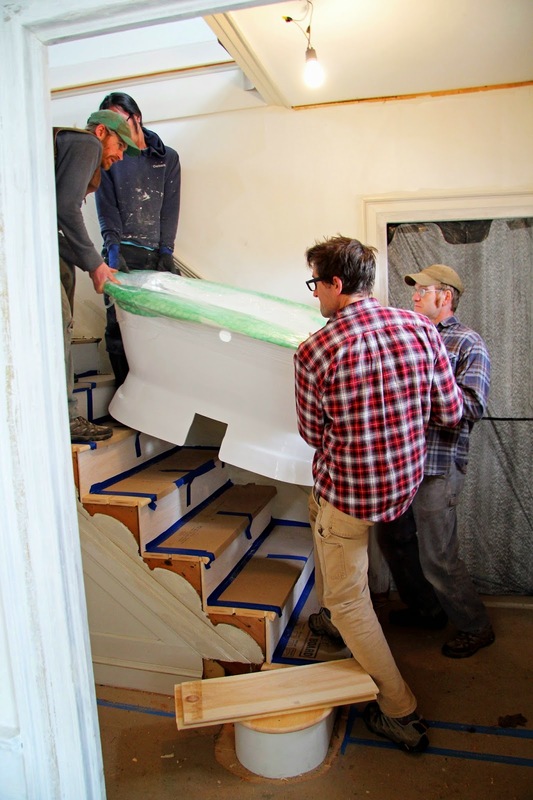 I would normally be a little nervous about a heavy bathtub being moved over freshly installed stair treads. 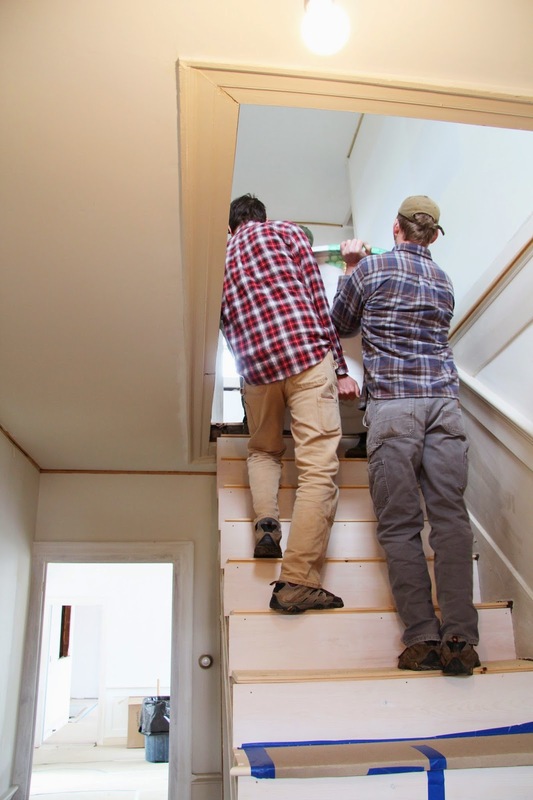 But since the movers were in fact the craftsman who built the stairs, it was comforting. You couldn't ask for more careful movers. I may have been holding my breath until this point when the tub was past the permanent treads (protected by ramboard) and onto temporary ones installed just for this purpose. And at last, in its (temporary) spot. This is the back of the bathtub, hence the plumbing access port. 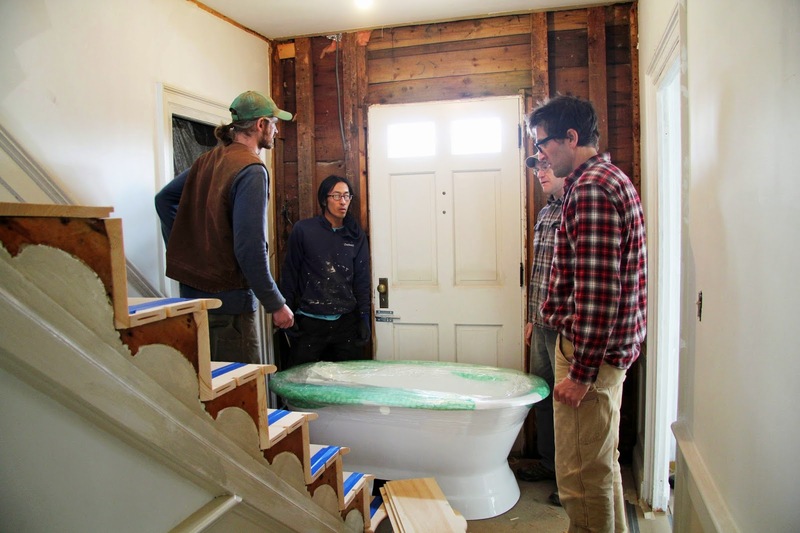 Here is a mock-up that Mike did for me (I love that he is so accommodating to do mock-ups, it helps me tremendously) showing the placement of the new pedestal tub in the master bathroom. AWESOME - yay! It's going to be so amazing. What wonderful fellas. You are blessed and fortunate to have things of this caliber in such talented (and strong) hands! PS You look so cute in that tub I actually giggled! 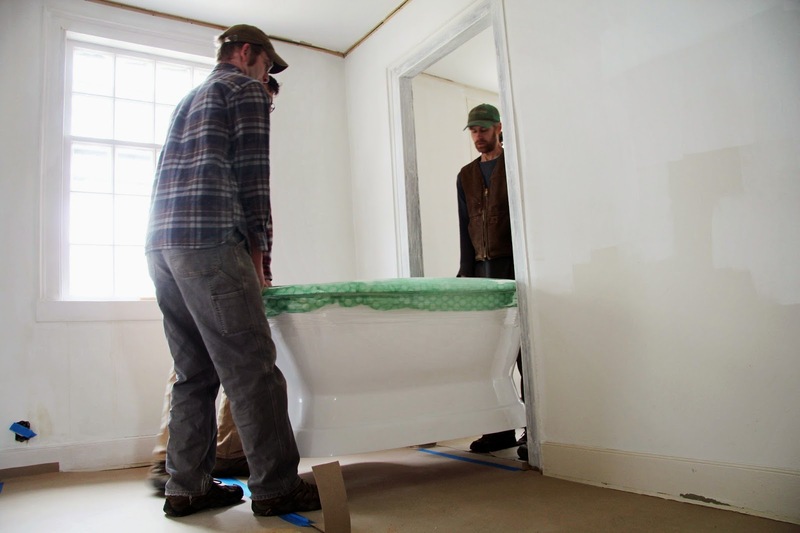 Beautiful tub, and your hubby IS very accommodating to create a mock up to help you envision the tub placement. I'm also a visual person who needs to see how much space something will take up in a room. 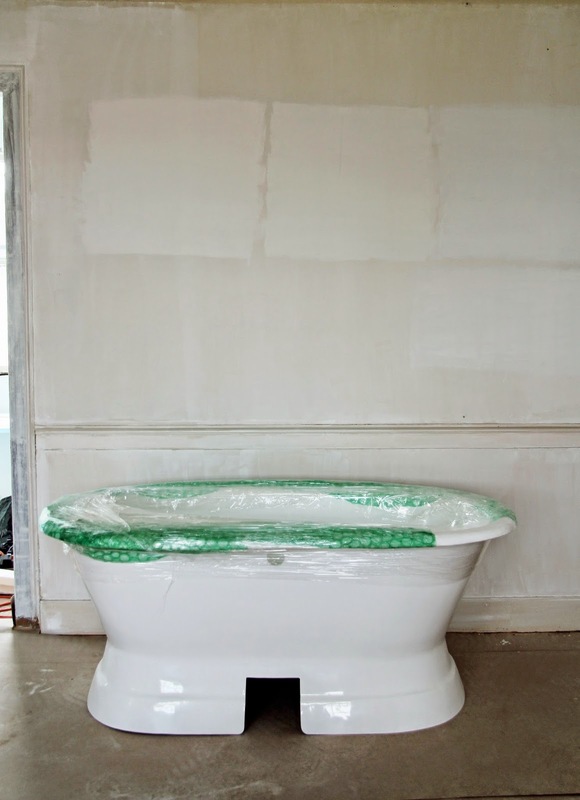 I love that your tub mock up included height and everything! Nicely done. I'm getting excited to see it installed! I love it, thanks for the update! Handsome and strong! A winning combination! I agree with Michele- you look adorable. Karla in (very dry) CA. I don't know what I envied more ... having 4 handsome men doing this for you or the big deep cast iron tub which is a real beauty ! I had one in Argentina and the one thing I had to adjust to was the cold cast iron .. it has to heat up when the water is in it .. so it cools the water etc ..
Amazing grace, your tub fits perfectly as planned, and what a guy to go to extra lengths to accommodate your floor planning. 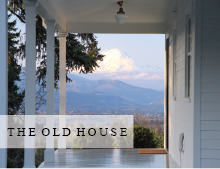 It's going to amaze us with all the grace and beauty of new and old you add to your home. I agree with Michele on your relaxed grateful beauty to able yourself in imagination of how this tub will feel when it's soaking time. Perfection and worth the effort on all parts. What is the color on the far right?! xxoj. I love this post! How beautiful you look in the tub. How sweet. Mike looks so happy working and doing what he loves. Can't wait to see the master bath. No handsome talented strong patient cast iron stairwell moving team ever had a tub muse as radiant as you! My tub sat on my driveway for weeks. Very nervous moments carrying something so important up something so important. Soon you can relax in it. I always love seeing the progress..but got a little nervous watching them carry it up those stairs...I'm sure you did, too! Can't wait to see it in it's forever home...I'm sure it will be lovely..it already is! Ah yes, been there! My hubby is a weekend warrior and works all alone. We had to round up a bunch of neighbors to help us...but it gave us a great reason to throw an impromptu bbq as thanks! Looks fabulous, can't wait for the reveal! 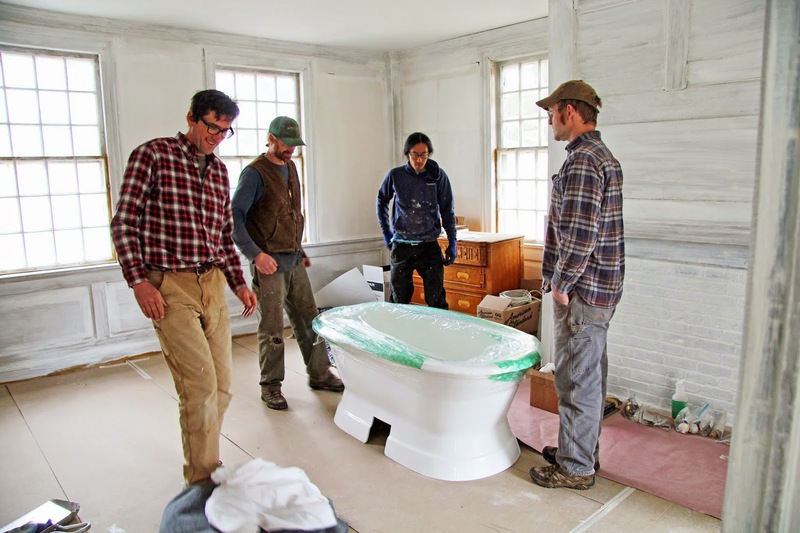 Wonderful photo of you "testing" the tub :) Strong and handsome certainly are great attributes and come in handy during a renovation. Look forward to the long story of the tub. I love the tub and I couldn't help noticing that you bricked up the fireplace.in the parlor. It was that way when we bought it. The furnace exhaust for the main house goes up that chimney. We may re-route it someday, but not in the near future. The tub is beautiful. Can't wait to see more of your progress. You are the cutest! I love your tub and location. Your home is coming right along! Do you use Instagram to document your progress as well? 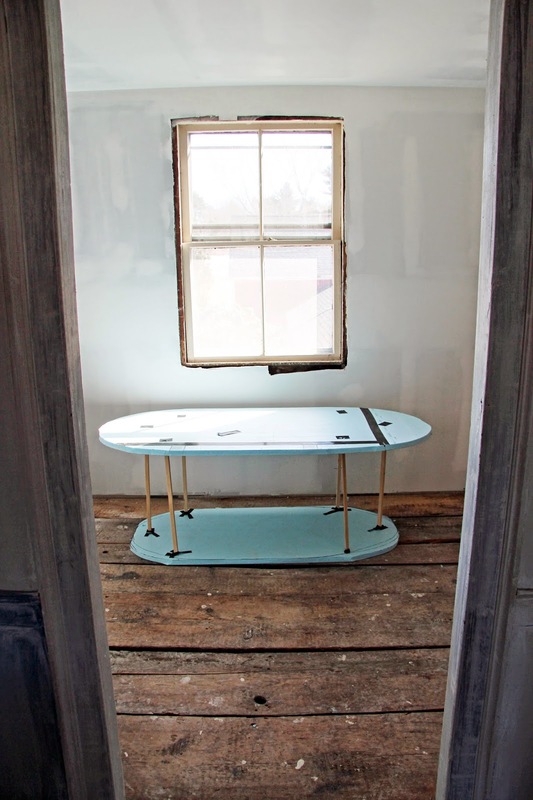 Your tub is going to be gorgeous under that window! I have learned that I like to NOT know what is going on when things are being moved.... That way I can't get stressed;-) BUT this doesn't work now that I am a blogger and need to document the process!!!!! Grrrr.... my sanity is out the window now... like moving a whole building across out property... I would have rather climbed under the bed and not come out til it was done.. but no!!! I had to document it. Buying a farm and becoming "farmers" means there are some funnies that need to be covered. I LOVE the tub by the way!!!!! I can't wait to see the finished project! The tub is amazing, such a wonderful picture with you in it - one for wall in black and white. Also spotted a very lovely chest of drawers by the window. Agree with Cari, would love you to have an instragam feed of progress. Glad to see everything coming along, so enjoy the updates. Beautiful tub to soak in! I can't wait to see the continued progression of your restorations.